Not too long ago, I dove into some of our copious data from the 2013 State of Inbound Marketing Report to figure out where marketers get their customers. So I thought it'd be a good idea to back up a little bit and look at not just where customers come from -- but where leads come from. After all, that's where it all starts, right? 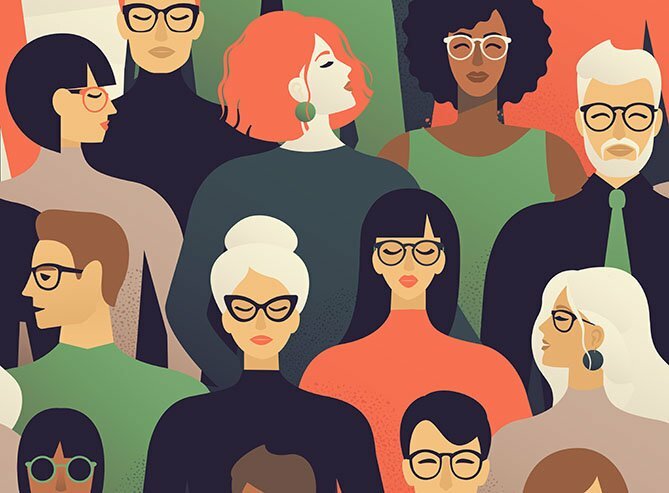 As with my previous post about customer generation, I tried my best to address as many demographic areas as possible -- B2B versus B2C, U.S. marketers versus international marketers, as well as several different industries. If you don't see your company type represented in this data but you're interested in seeing more information of this nature, leave me a note in the comments and I'll see what I can do next time I go data-diving. B2B companies get twice as many leads from telemarketing than B2C companies do (8% versus 4%). B2C companies get 3X more leads than B2B companies do through traditional advertising (9% versus 4%). 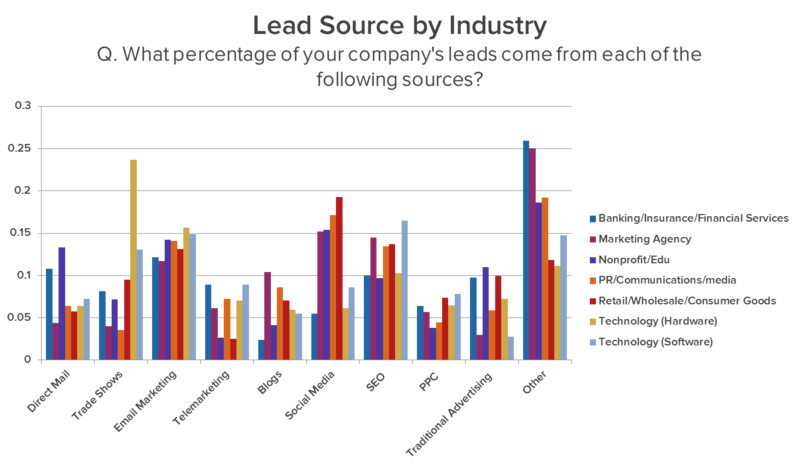 The best three lead sources for B2B companies are SEO (14%), email marketing, (13%), and social media (12%). The best three lead sources for B2C companies are social media (17%), SEO (16%), and email marketing (15%). The worst three lead sources for B2B companies are traditional advertising (3%), PPC (6%), and direct mail (6%). 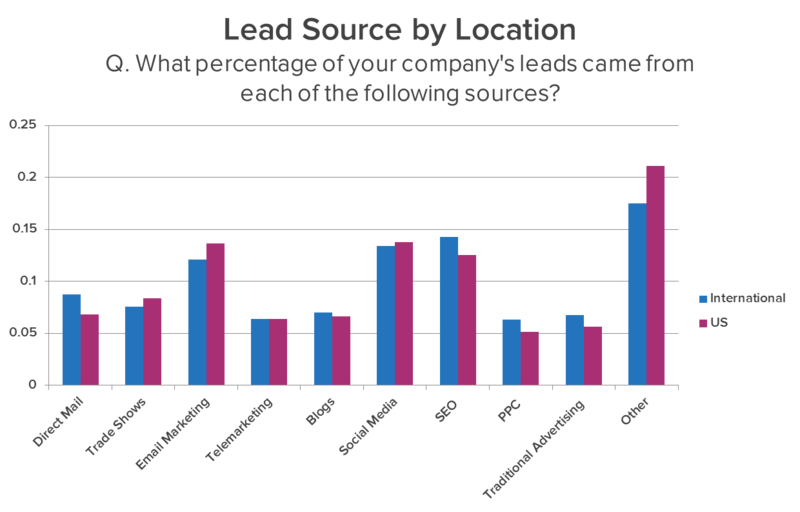 The worst three lead sources for B2C companies are telemarketing (3%), trade shows (6%), and PPC (6%). 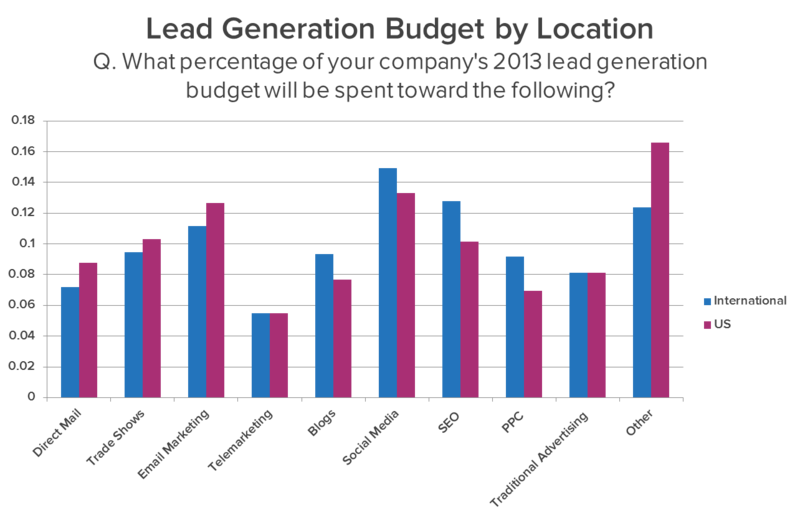 B2B companies are allocating 12% of their budget to trade shows but only getting 9% of their leads from that source. 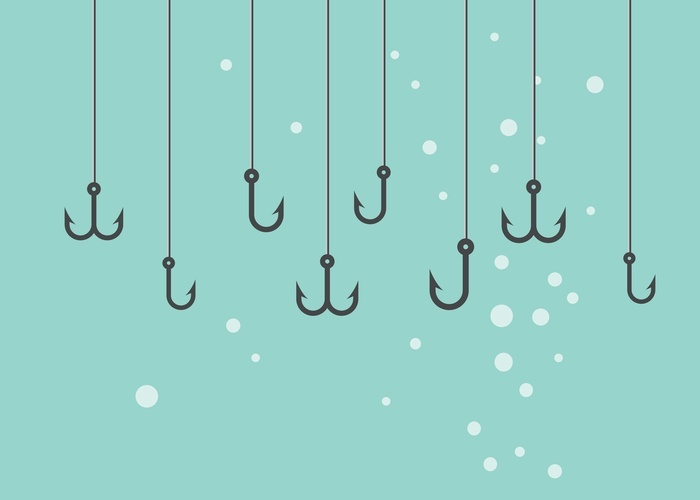 B2C companies are allocating 13% of their budget to traditional advertising but only getting 9% of their leads from that source. With direct mail, trade shows, telemarketing, and traditional advertising, the bigger the company, the more likely they are to get leads from the aforementioned tactics. Small companies are more than twice as likely to get leads from social media than large companies (18% versus 7%). Large companies are almost three times as likely to get leads from traditional advertising than small companies (11% versus 4%). 9% of small business leads are from blogging, and they are allocating 12% of their budget toward this lead source. 15% of leads from medium-sized companies are from SEO, but they are only allocating 12% of their budget to this source. 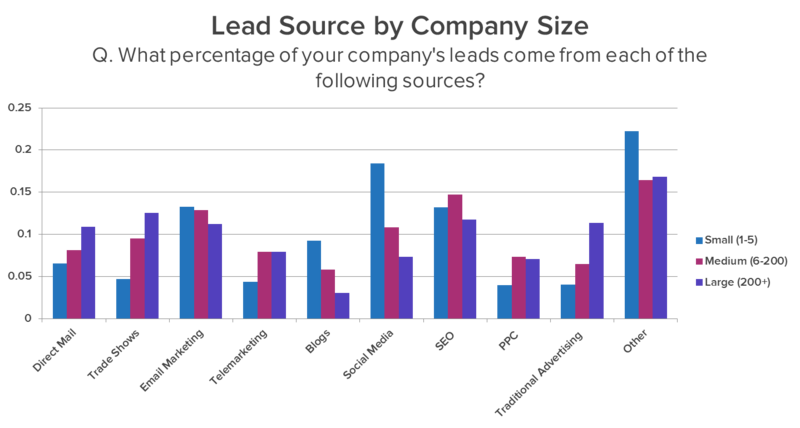 12% of leads from large companies are from SEO, but they are only allocating 9% of their budget towards this source. 11% of their leads are from traditional advertising, but they are allocating 15% of their budget to this lead source. The Nonprofit/Edu space and the Banking/Insurance/Financial Services industry get more leads through direct mail than their counterparts -- 13% and 11%, respectively. The Technology (Hardware) industry gets at least double the number of leads (24%) through trade shows compared to the other industries represented. Marketing agencies get the most leads from blogging compared to the other industries. The Retail/Wholesale/Consumer Goods industry gets 19% of its leads from social media, the most when compared to the other industries surveyed. The Technology (Software) industry gets 16% of its leads from SEO, the leader with respect to the other industries surveyed. 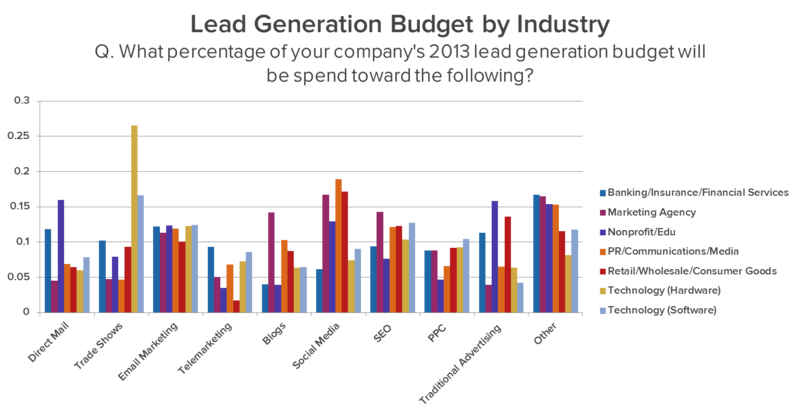 In the Banking/Insurance/Financial Services sphere, only 6% of leads come from PPC, but they are still allocating 9% of their lead generation budget toward this lead source. 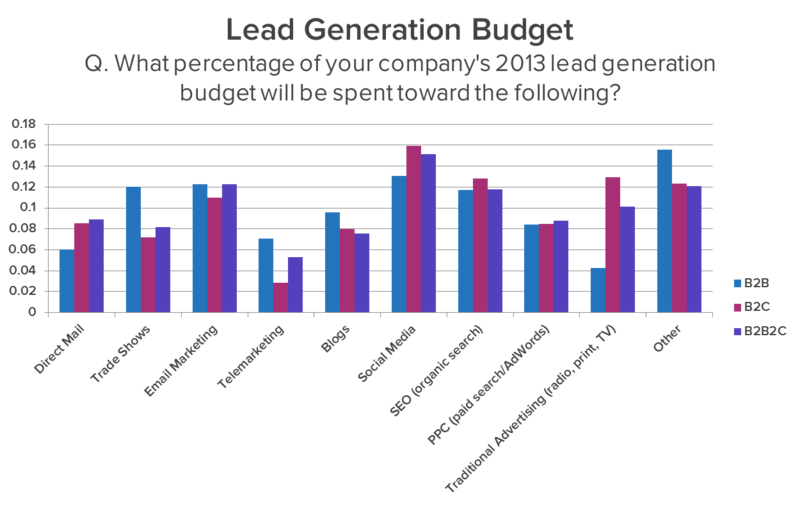 Marketing agencies are allocating 14% of their lead generation budget toward blogging. 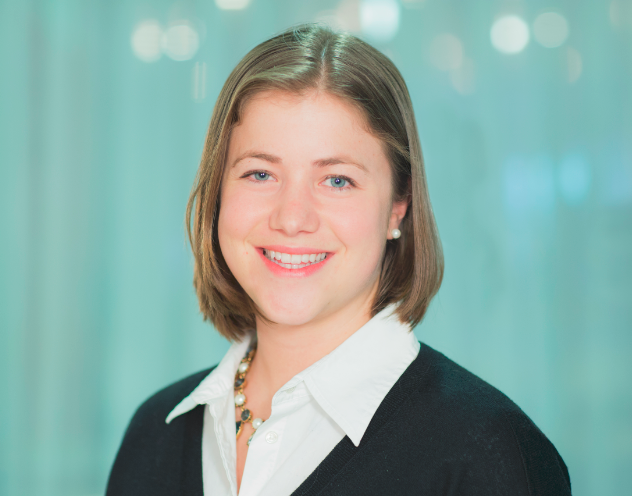 In the Nonprofit/Edu space, only 11% of leads come from traditional advertising, but they are still allocating 16% of their budget toward this source. In the PR/Communications/Media sphere, only 4% of leads come from PPC, but they're allocating 7% of their lead generation money toward this source. 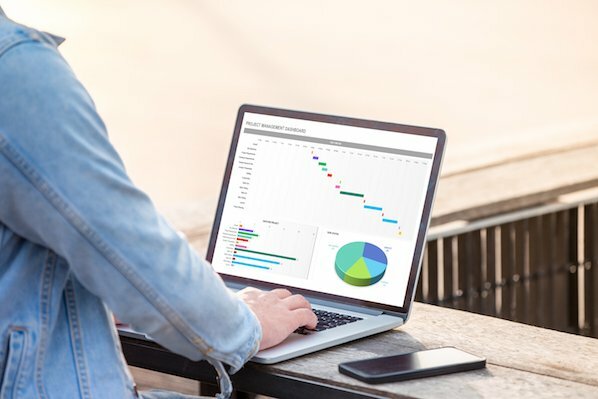 In the Retail/Wholesale/Consumer Goods industry, 10% of leads come from traditional advertising, and they are allocating 14% of their budget toward this source. In the Technology (Hardware) space, 16% of leads come from email marketing, and 12% of their budget goes toward this source. In the Technology (Software) industry, 13% of leads come from trade shows, and they are putting 17% of their budget toward this source. U.S. companies get more leads than international companies for the following sources: trade shows, email marketing, and social media. International companies get more leads than U.S. companies for the following sources: direct mail, blogs, SEO, PPC, and traditional advertising. International companies get 6% of their leads from PPC but are still allocating 9% of their budget towards this lead source. U.S. companies get 13% of their leads from SEO but are only allocating 10% of their budget toward this source. 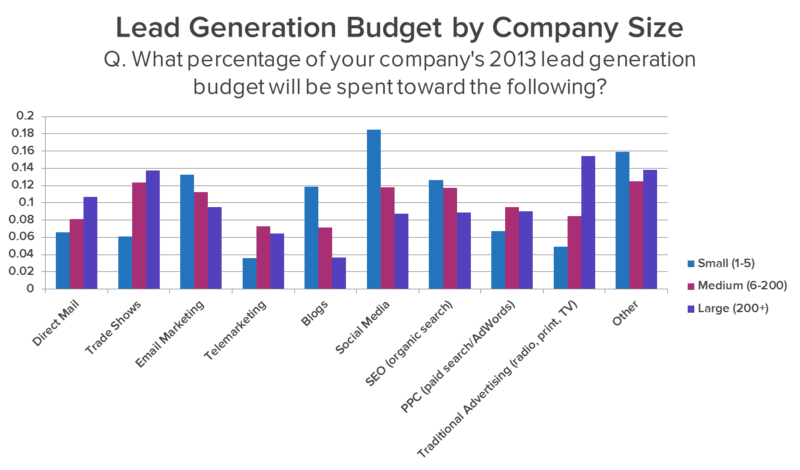 B2B companies have a significantly higher cost per lead ($43) in comparison to B2C companies ($15). 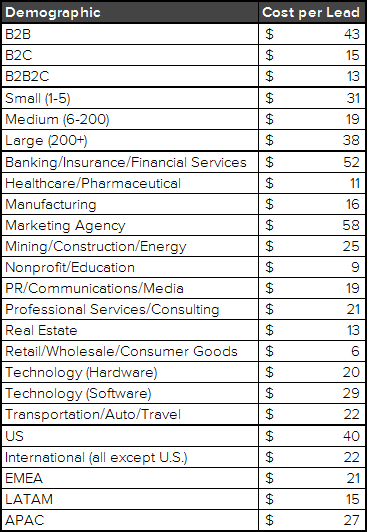 Medium companies have the lowest cost per lead ($19) in comparison to small ($31) and large ($38) companies. 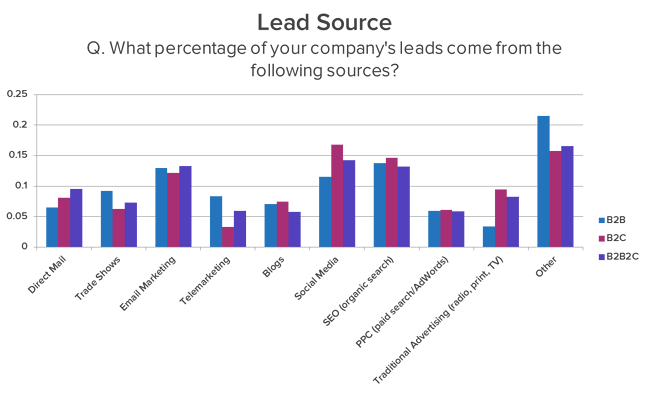 Marketing agencies have the highest cost per lead ($58) whereas the Retail/Wholesale/Consumer Goods industry has the lowest cost per lead ($6). U.S. companies have the highest cost per lead ($40); LATAM has the lowest cost per lead ($15). 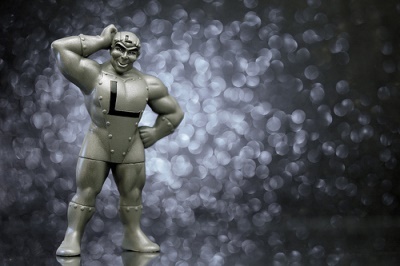 Is any of the lead generation data in here surprising to you? Does it jive with what you're seeing in your own business? What other data would you like to see?